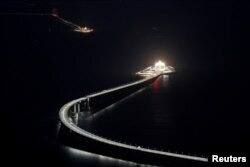 China has opened the world’s longest sea-crossing bridge and tunnel. The structure links Hong Kong and China’s industrial Pearl River Delta area. Chinese President Xi Jinping declared the Hong Kong-Zhuhai-Macau Bridge open on Tuesday. The bridge is actually both a bridge and tunnel system that involves man-made islands. The combined length of the project is nearly 40 kilometers, depending on the starting point used. The sea bridge took almost 10 years to build. It cost the Chinese government an estimated $20 billion. The project was expected to be completed in 2016, but building problems and extra costs delayed the opening. The tunnel section of the system is designed to permit ocean-going ships to enter the Pearl River. The new link will reduce travel time between Hong Kong and the Pearl River area from several hours to about 30 minutes. The Pearl River area in Guangdong province has been a center of economic development in China for 40 years. The bridge also links Hong Kong and the mainland to another former colony, Macau, which is famous for its casinos. The bridge is a symbolic link between Hong Kong and mainland China. Britain handed over control of the Hong Kong to mainland China in 1997. But the two sides agreed that the territory would continue to have its own legal and economic system for 50 years. The so-called “one country, two systems” agreement is to last until 2047. The completion of the project also has political importance for Xi’s administration. Mainland China has opposed protests and expressions of civil liberties that are guaranteed under Hong Kong law. The completion of the Hong Kong-Zhuhai-Macau Bridge follows the opening of a new high-speed rail line linking Hong Kong and the mainland. Claudio Mo is a Hong Kong politician. She told the Associated Press that the bridge is mostly of political importance. Media reports say the bridge will also use high-technology devices, including a facial-recognition system used to find especially sleepy drivers. Rules on the use of the bridge are still being considered. Reuters reports that private vehicles will need special permits to use the bridge. The completion comes as China faces increasing pressure from the United States over trade issues. The administration of President Donald Trump has placed import taxes on over $250 billion worth of trade with China. China has answered with its own import taxes. The United States and Europe argue that China continues to place unfair barriers to trade on foreign companies, even though it is a party to international trade agreements. China also faces sharp changes in its stock markets, heavy public debt and a slowing economy. Mario Ritter adapted this story for VOA Learning English from AP and Reuters stories. Ashley Thompson was the editor.